Calis Beach is now a very popular holiday resort on Turkey's "turquoise coast" - and the crystal clear deep blue seas explain that name easily. But for Calis, it is not so easy as "Calis" means work in Turkish and that reveals a little of it's history. It hasn't always been a holiday destination - Calis Beach was "Work beach" where a small railway ran across the beach to the jetty (where Sat Restaurant now is at the far south end of the beach) with loads of chromium, mined inland. Those days are well in the past now and the only work done on Calis Beach nowadays is applying the sun cream - Calis is reported to have around 300 days of sun each year - and the beach is lined almost from end to end with restaurants serving superb Turkish cuisine and international favourites. The pedestrianised Calis promenade is the place to watch the simply stunning Calis sunsets. Calis is actually part of Fethiye, who's centre lies to the south side of Fethiye bay, while Calis sits on the east side. Fethiye is an excellent place to visit - there are plenty of reasons - the narrow lanes of the Paspatur (known as the "old town") with it's restaurants, bars and souvenier and gold shops, but actually getting there can be a lovely experience on the Calis water taxis that leave the canal just behind the seafront (see our Calis Map section for details of where that is). Water taxis leave every half hour but don't believe the advertised "on the hour and half hour" - this is Turkey and it never is! To use to Calis water taxi service simply go to the kiosk and purchase your tickets (single or return) and once the boat is docked you will be ushered on. It's a very laid back and enjoyable experience. In fact, if time is on your side it is the only way to travel! There are many things to do in and around Calis - you can see some suggestions in our "Things to do" section - and you will certainly not find it difficult to find the excursion sellers around Calis. On the whole the range of trips, the quality of them and value for money is excellent. You are generally collected from your hotel and returned there and lunch is often included. Another option is to try the local bus service - the little white "dolmus" (pronounced dol-moosh) minibuses pass very regularly on their routes and don't worry about using them - you can stop them anywhere along their route (but try and find a safe spot for it to stop) and you pay the driver. If you can't get to the driver because you are on a packed bus, worry not - pass your money forward and it passes from passenger to passenger until it reaches the driver. Don't forget to look out for your change - it heads back the same way - a very different experience. Always think to offer your seat on a busy dolmus to older folk - and don't be surprised if a child sits on your knee on a busy journey - it's quite normal in Turkey! 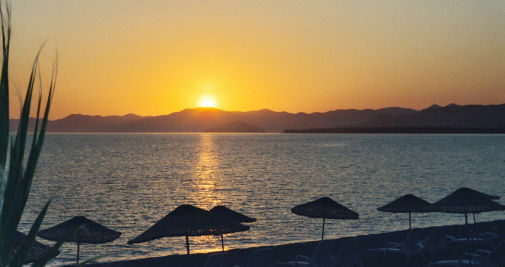 Finally - did we mention the spectacular Calis sunsets?